For 25 years Ravi has been researching the two types of entities in the universe. Type 2: Things like consciousness, mind, memory, thoughts, feelings, don't occupy any physical space. So, where do they exist? Where as Physical sciences work in type 1 area only, Probiotic Space Sciences work in type 1 and type 2 areas. His new theory "The Living Grand Unified Field Theory" unifies the two types on one continuum. This theory is linked to "ProBiotic Space Sciences", the principal science of cognition and realization unifying the two, into one complete whole. Please start a discussion on the Blog linked to this site. Thank you. Cosmologists and Astrophysicists study and measure visible matter like planets, stars and galaxies in free space. This is easily done with modern instruments. The ground-breaking substrate model postulated here, examines invisible space as a field and the motion of a body of space relative to another body of space or to ambient space. This is not easy to imagine akin to the concept of captured space versus coursing space, both in motion with real boundary-layer quantum effects (Antariksha). The type of space (Dyau) occupied by a living thing (with consciousness) is qualitatively different from space (Prithvi) occupied by ordinary matter. The former captures space while the latter displaces space. These facts give rise to the notion of "density" associated with space. We also study why and how Motion (Kinetica) by itself got created before Space. Then came the physical space which caused Expansion. Then came the first appearance of matter in the universe. Space as a field with properties of motion and density is difficult to imagine. and even harder to observe and study. Such concepts are the substance of the future, when the human mind opens up. MotionSpace will reveal the origin of the present episode of the universe. SpaceDensity will reveal the physics of the behaviour of matter in the present episode of the universe. Come and join me in this fantastic journey of exploration and enlightenment beyond your wildest dreams. Good news is that we all have the means and skills to accomplish this. All we have to do is to open our MINDS. It is the way of the future! 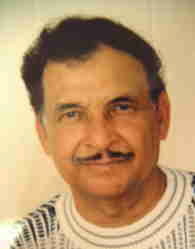 The human-cosmos relationship is based on the nature of space itself, the principal constituent of the universe. Everything exists in space and space exists in everything. So, everything present in the universe can be represented by a space density value, averaged out, over the space volume they occupy. The volume of space occupied by a living thing with consciousness and intelligence is "captured space" called Dyau (pronounced Dee-ya-oo). This Dyau space has a space density associated with it. 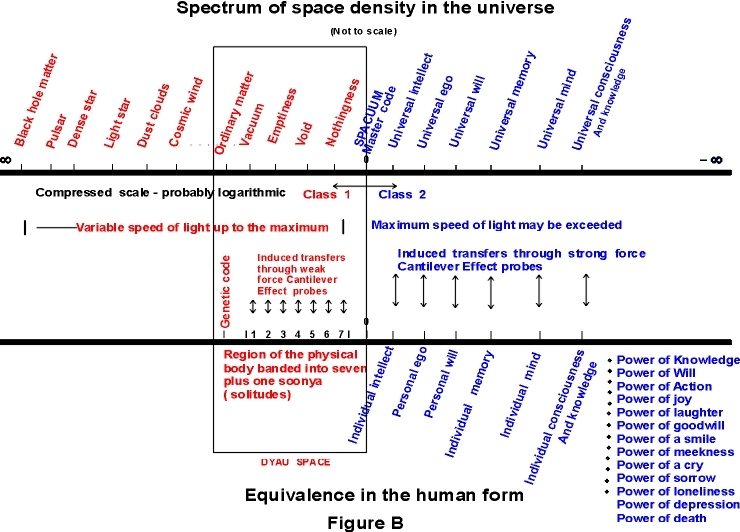 Figure B shows the whole universe in terms of space density. Super Blackholes have an infinitely high density of matter. So the space they occupy has a density approaching infinity. This type of space is called Prithvi, because no consciousness or intelligence is associated with the matter. Going to the right from Blackholes, less dense mass bodies are shown on a decreasing space-density scale in red lettering. These are all type 1 entities. Within the vertical rectangle on Figure B, Dyau space limits are marked on the lower line as density equivalences in the human form. Dyau space is special because all living things with consciousness and intelligence have an enclosing physical shell, a body or a membrane associated with them. It is a combination of type 1 and type 2 spaces. The interactive zone or the boundary layer between the type 1 space and type 2 space is called Antariksha. Antariksha space is an extremely complex cloud of subtle halos. Because of this, some people 'feel' their personal 'space' violated when, suddenly, a stranger comes too close to them. Also note the type 2 entities are shown in blue lettering to the right of space density of zero, called Spacuum. For differentiation they are marked as having a negative space density. But they are very powerful as they have a spiritual force called Shakti associated with them. Good luck with your search for truth.